Rounding out our Nintendo news trifecta today is the annual Famicase art exhibition. 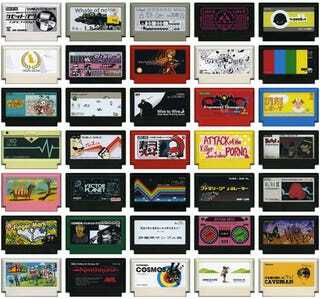 It's like many other art exhibitions from around the world, made infinitely cooler by the fact that the artwork is composed of imaginary games pasted to old 8-bit Famicom carts. More than 50 designers, illustrators and authors contributed to event this year, which is organized by Super Meteor game shop owner Satoshi Sagagami. Some are crazier than others, but all have a home in this Nintendo lover's heart. Personal favorite? Overly promiscuous R.O.B.-now we know what he's been up to all these years!